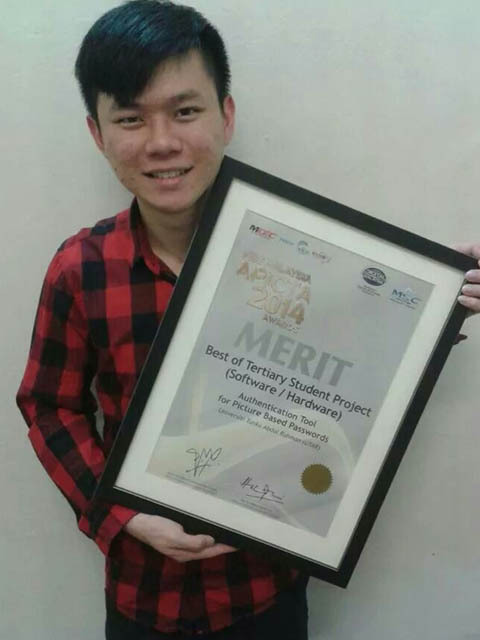 UTAR alumnus Goh Wen Bin received the Merit Award in the Multimedia Super Corridor (MSC) Malaysia Asia Pacific ICT Awards (APICTA) held at Wisma Radio in Kuala Lumpur on 19 October 2014. Goh is a graduate of the Bachelor of Information Technology (Hons) Communications and Networking from UTAR Faculty of Information and Communication Technology (FICT). He won the Merit Award in the Tertiary Student Project (Software or Hardware) category for his project titled ‘Authentication Tool for Picture Based Passwords’. It was also the topic of his Final Year Project (FYP) at UTAR.